As a Grace Partner, you are joining hands with Andrew and Jamie to help reach hundreds of thousands of people with the life-changing message of His love and grace. Grace Partnership is the most requested method of giving. It was established at the request of many partners who wanted their entire gift to be used to help send this message across Canada and around the world. Grace Partners have committed to at least $1 per day or $30 per month. You can honour that commitment in the way that is most convenient for you: make an annual gift of $360 or more, or a monthly gift of $30 or more. If you are unable to commit to $30 per month, you are welcome to pledge whatever amount you can afford. By partnering together, we are making a global and eternal impact. Your interest in partnership is evidence of the fact that not only has this ministry affected your life, but you also have a desire to help someone else and believe this message can provide that help. Together, through partnership, you and I can reach thousands of people with the nearly-too-good-to-be-true news of the Gospel. I believe the message the Lord has entrusted me to deliver will change the way the body of Christ perceives God. However, it doesn't matter how important the message is or how well I deliver it, until the message is sent, no one will hear. Partnership makes the delivery possible. The Apostle Paul understood his role as the messenger, but he also understood that partnership was not only about what he received but what the partners received as well. In Philippians 4:19 he wrote, "But my God shall supply all your need according to his riches in glory by Christ Jesus." This was written by Paul to his partners. The Philippians were the only ones who supported him after leaving town. In fact, they wanted to give more but didn't have opportunity. Paul was saying that there is a special provision for those who recognize the power in partnership. 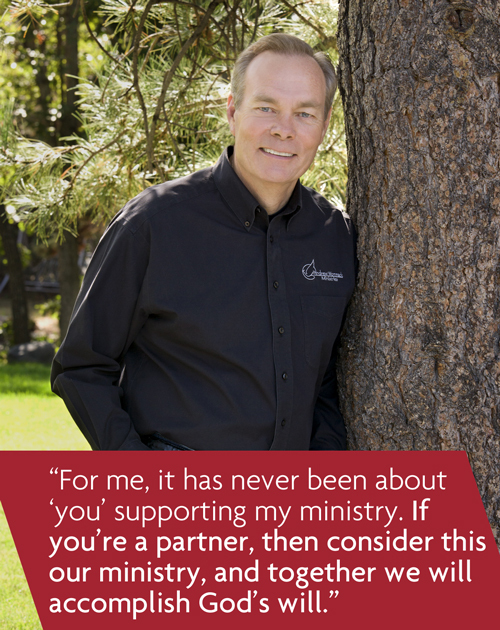 For me, it has never been about "you" supporting "my" ministry. If you're a partner, then consider this our ministry, and together we will accomplish God's will. In fact, I'm an extension of you and your obedience to God. Like Paul, I'm just the messenger that God has called for a specific purpose. If I fulfill that call, the fruit will be evident to everyone, and if I don't, then God will find another messenger and direct your support to that person. I would consider it an honor to partner with you in this vision of teaching the truth of the Gospel to the body of Christ in America and around the world. Jamie and I love you and appreciate you. Thank you for your support.